Stay at the University Plaza Hotel for Queen City Century 2018 – special rate! 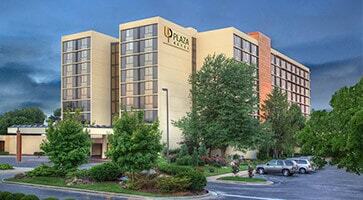 The University Plaza Hotel in Springfield has given us a special rate for Queen City Century riders. Stay the night or stay the weekend–and save! The University Plaza Hotel will honor our special rate as long as they have rooms–but they’re going fast, so book early! Click here to reserve your University Plaza Hotel room at our special Queen City Century rate. The University Plaza is within a mile of the Queen City Century start/finish and within easy walking distance of breweries, restaurants, nightlife, and attractions in Springfield’s downtown area. It’s less than a mile from the University Plaza to Springfield Brewing Company, where the Queen City Century will start and end. So you can easily walk or bike from the hotel to the ride. You can also stay after the ride and enjoy a number of establishments in Springfield’s Downtown Brewery District–all within walking distance of the University Plaza. Springfield’s downtown area has lively nightlife and many restaurants to offer–again, all within easy walking distance of the University Plaza. The University Plaza Hotel & Convention Center offers an unbeatable downtown location. Modern amenities and Midwest hospitality combine to offer comfortable stays in a welcoming setting. Business travelers love our free Wi-Fi, hot breakfast buffet, fresh Starbucks coffee to go and relaxing hotel amenities. Amenities include indoor and outdoor pools, a sundeck, or enjoying cocktails at our Terrace Lounge.